It’s the most awkward day of the year. It may involve a blind date, or a disappointing rendezvous with your current partner. On this day those with no plans at all feel even more uncomfortable. February 14th is a day to celebrate love (not only romantic), so don’t let feelings of awkwardness get in the way. Whether you’ll be on a first date or going steady, for Valentines Day you’ll want to be ready. The following are some common Valentines conundrums you can prepare for. Your date arrives late: It’s not mean to leave after fifteen. Even if your date lets you know he or she is running late, which they should do, it is not impolite to call off the date after fifteen minutes. If you decide to wait longer, don’t get angry at your date when they finally arrive, and don’t dwell on their tardiness. Catfish is on the menu: Anyone in the online dating game knows to post only their best pictures. Your date is no exception. When meeting someone online, manage your expectations. Don’t be surprised if they appear somewhat less attractive in person, and certainly don’t make things awkward by commenting about it. If you feel your date’s online profile was a blatant misrepresentation, call MTV or call it a night. Not knowing who pays: If you invite, you pay tonight. The one who initiates the date is the host. The host picks up or arrives early, and the host pays. If at a restaurant, leave your credit card with the maitre d’ or arrange to have the bill brought to you. You don’t know where to sit: Here again the rule of the host applies. The host gives the guest the best seat at the table. That’s usually the one facing the room. When in doubt, let your guest choose first. Your phone rings: Your Apple phone is not for dessert, so keep it off the table. 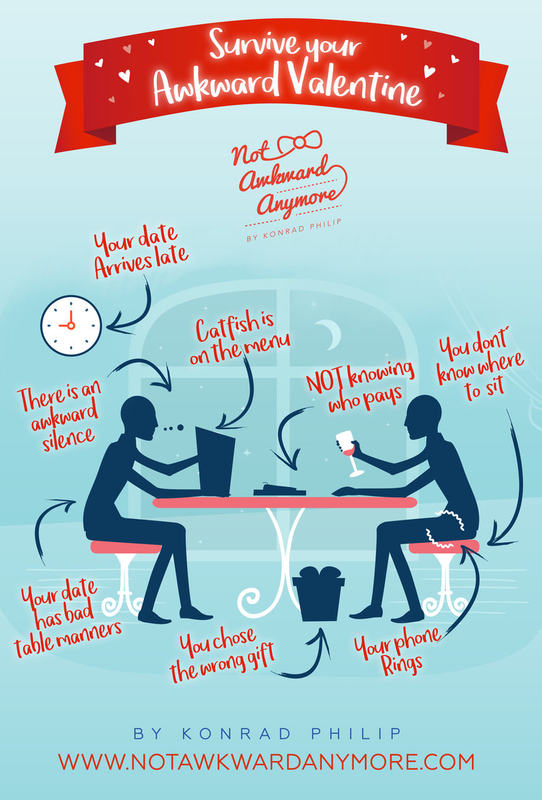 Your date will certainly feel awkward sitting silently while you talk to or text someone else. Anyone who spends this special day with you deserves your full attention. If by some chance you are expecting an urgent call during the date, try to let your partner know ahead of time. Otherwise turn the phone off or silence it. There is an awkward silence: If you’re not yet comfortable with silence, be ready with some things to talk about. If you don’t want to get “talk blocked”, click here. Your date has bad table manners: Nobody is perfect, and calling your date out for his or her imperfections will just make things uncomfortable for you both. If table manners are important to you, and your date’s cut you like a knife, maybe its time to stick a fork in the relationship. You chose the wrong gift: In general, for new relationships a simple, mush-free card or some candy will suffice. The six-month mark allows for more personal gifts. Only give expensive gifts such as jewelry and clothing once you feel your partner would reciprocate.